RV Tire Safety: What readings should I see from my TPMS? Question about tire temp. 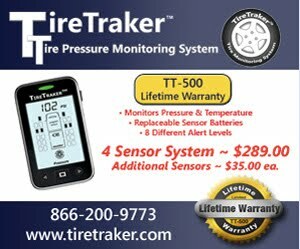 If I have an accurate "infrared" thermometer which I use to check the tire temps, should the sidewalk or contact patch be used? Will either help check internal tire temp? IR temperature guns may be accurate but in my experience they are not precise enough and they are not measuring the important location. You need to read the temperature about 1/8" to 3/6" below the surface of the tire in the location of the thickest part of the shoulder. so neither the sidewall or the tread contact patch are the correct location. Rubber, unlike metal is a very poor conductor of heat so your reading may be accurate for average temperature of the 1/2" diameter area the gun is reading but the point of most interest on the surface is in the bottom of a groove which may only be 0.07" wide so your gun can't focus that accurately.